I have been blogging for one year. 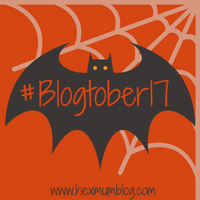 Well one year and one month to be precise as I started at the beginning of the 2016 #blogtober. When I started the blog I wasn’t sure why I was doing it or what I hoped to gain from it. One year one, guess what, I still don’t know. I enjoy the writing. It is cathartic and gives me something to focus on that requires structure and research. Both these two things are skills I was good at and enjoyed in work before I left to have my kids. I enjoy the community of bloggers that exists (although as with all walks of life some are erm just not nice people. Luckily I know some lovely ones so don’t need to bother with the nasty ones) and have become a lot more aware of other extremely useful blogs since starting my own one. I’m not going to sugar coat the truth though. I write because it feels good to create something from nothing and have a place that isn’t touched by the kids (even if I mainly write about the kids!) but also I do write as I enjoy trying out new things and reviewing products in return for my writing skills (and cute kid photos!) I don’t treat the blog as a job, heck I don’t have time too, but I do take it seriously and do like that I can contribute to our finances by getting products which therefore saves us money to be spent elsewhere. I have made a little cold hard cash from the blog but only from a few sponsored posts. I haven’t gone looking for work but have made a few hundred pounds from these so next year I intend to more actively look for this type of work. I am also thinking about setting up affiliate links as I often include links to products just for ease for the reader so why not make a little money if I am writing about them anyway. Now I just need to figure out how I do that. Other that reviewing random products and receiving them in exchange for a blog post, I have found for me one of the most successful things I have done is approach companies with a very specific post idea when there is a product I particularly want to review. I needed a car seat for Faye but I very specifically wanted the same one Aiden has that is rear-facing and goes up to 12 years so will do all her car seating life. I had researched Aiden car seat before I had the blog and we love it. It comes from Sweden as these types of seats just aren’t available in the UK and costs about £800 all in with all the extras. After a very surreal phone call to Helsinki, I pitched the idea that more people in the UK need to know this seat is available to be shipped here and they went for it. I didn’t compromise on the seat I wanted for my kids safety, the company got an English review post which they put on their website and we saved £800. My most successful review of this type would have to be the one I wrote in September for the removals firm that moved us from Edinburgh to Oban. Again I pitched my unique post angle which was making moving easy for families and one particular Glasgow based company agreed to do the whole move for free in exchange for my blog post. It took two huge vans and two days to move with a team of four men each day. The cost had we needed to pay would have been almost £2,000 so I was pretty chuffed with that one and Keith was equally impressed I managed to pull it off after I told him I was going to get us the move for free. In terms of statistics my following is increasing but at a slow and steady pace. I am sure I could up my game if I gave it even more time and maybe I will at some point but for now it is all about that balance. I don’t want the blog to add stress to my life but rather to compliment it and be for me otherwise let’s face it what is the point. Instagram – 3k (790) 1,125 yeah unlikely! DA – 25 (12) 25! Whooohoo I did one! What a fantastic year you’ve had! Well done for the pitching – I’m 2 years in and haven’t dared yet! Well done you! You have had an amazing year blogging. Go you for pitching to brands and getting some awesome things.